Do you have gas pains? The pains that come from handling gas for your forklift. 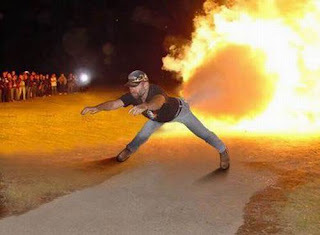 Unlike the man in this picture, handling gas can be a real problem for most people. Unless you are a professional, it is highly recommended you not try this at home or at work or anywhere else on this planet. The process of handling gas for your forklift is not only dangerous but it’s also a dirty and unpleasant process. Gasoline powered forklifts are well known for emitting large amounts of noxious fumes, so ventilation is a must. Working with gas can be a real pain…well, you know where. The solution to these issues is a forklift that runs on propane. You can purchase your forklift already outfitted with a propane fuel system or have your gasoline powered forklift retrofitted. Any forklift that can run on gasoline can also run on propane. LPG is liquefied petroleum gas commonly known as propane, a combustible hydrocarbon based fuel. It comes from the refining of crude oil and natural gas. At normal pressure and temperatures above -44F Propane remains in it's gaseous form. At lower temperatures and/or higher pressures propane will become a liquid. Propane is colorless and odorless. For safety reasons, propane is required to be distinctly odorized so that the presence of gas in air is easily detectable. This is achieved by adding 1.0 lbs of ethyl mercaptan, or 1.0 lbs of thiophane, or 1.4 lbs of amyl mercaptan per 10,000 of liquefied petroleum gas. There are currently three grades of propane available, HD5 for internal combustion engines, commercial propane and commercial propane butane mix for other uses. How does a propane forklift system work? 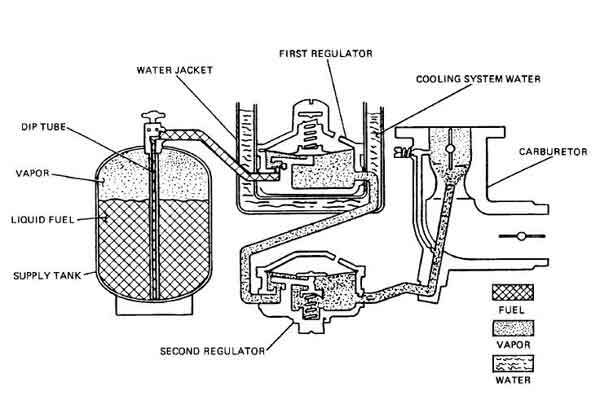 A typical LPG system is illustrated to the right. The fuel is transported in an 8 lbs fuel tank. Fuel tanks are removable from the forklift and can be filled on site or at an LPG retailer. In this system, liquid fuel exits the storage tank by a tube mounted inside the supply tank. The tube is configured so that it is immersed in the liquid fuel at all times. The fuel then is routed to the first regulator. This regulator reduces pressure to 4 to 15 psi. The liquid fuel exits the regulator as half vapor and half liquid. The vapor and liquid combination then is heated, causing it to become all vapor. The second regulator reduces the pressure of the gas to atmospheric pressure. The gas then enters a carburetor or mixing valve and then enters the engine cylinders. So next time you are attempting to balance the red gasoline can or looking for a funel to use when pouring the gas into your forklift, you might want to think about converting to a propane forklift sometime soon. If you have questions about how this process is done or what it may cost, contact your forklift dealer for further details. While both oil and propane have their own risks, I have to agree that LPG does not produce as much noxious fumes as oil. Combine this with the fact that propane can be cheaper than petroleum, then I'm expecting it to only be a matter of time before LPG overtakes petroleum products as the fuel of choice.